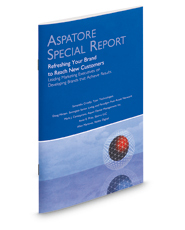 Refreshing Your Brand to Reach New Customers is an authoritative, insider's perspective on the process of tackling rebranding and setting a positive course for a brand's future. Marketing executives from across the nation guide the reader through the process of branding, the effective use of the latest marketing tools, and how to best develop buy-in from the entire C-suite. Covering a range of topics from developing quality strategies that help strengthen a company's brand to using customer engagement and feedback to assist with branding, these authors explain many aspects of the role marketing plays in the success of a modern business. Additionally, these leaders reveal their advice for managing multiple brands, making sure a brand reaches across multiple generations, getting the most return on investment, and achieving positive brand awareness.